So how do you solve the problem of creating regular blog posts your audience want to read? I’m glad you asked… Learn how blog post interviews can help. Do you struggle to find the words to write a business blog? Or lack inspiration for creating posts your audience want to read? We’ve all been there. You know producing regular content for your business blog is important. The statistics tell you so. But creating regular useful and relevant content is time-consuming and challenging. Just imagine what it would be like if there were a quick and easy way to generate a blog post. Better still, a blog post you can repurpose and use the content over and over. The good news is, there is a magical piece of content that ticks these boxes. It’s a piece of content that practically writes itself. 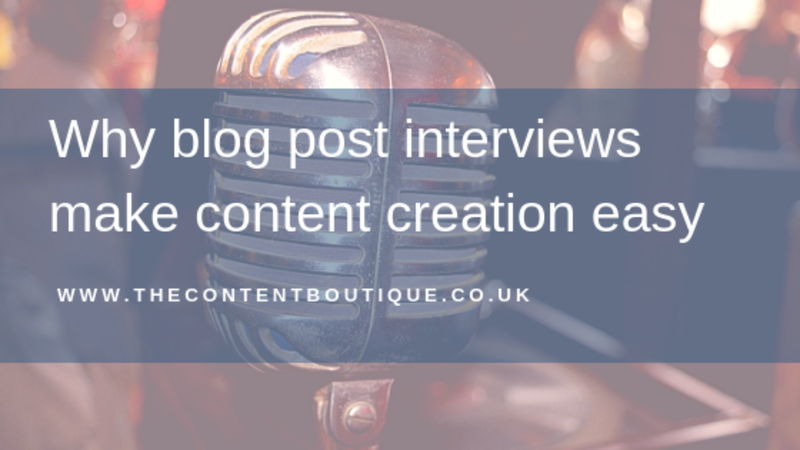 Keep reading, and you’ll find out why blog post interviews make a valuable addition to your content calendar. What makes the blog post interview so special? A simple interview provides you with the material to create a variety of content types. First off, you can transcribe an interview and publish it in its own right. Then you can use it as source material for other articles. Beyond that, you can turn a blog post interview into a mini case study, a profile or an expert guide. But that’s not all. You can collate quotes from your interview to form a post about predictions or a roundup of views on a particular subject. So how do you go about creating a blog post interview? To begin with, make a list of potential interviewees. Then put together an outline of topics you want to discuss. When you contact your interviewee, get buy-in by making it clear how you intend to promote the interview. Finally, make a list of questions and email them to your interviewee so it can prepare. You can choose to conduct your interview over the phone or by Skype. Alternatively, if you have time, you can do it in person. To make sure you capture your interviewee’s quotes, use an app to record your conversation. I use Tape A Call on my phone, Call Recorder on Skype and a dictaphone for face to face interviews. As the interviewer, a blog post interview is an easy way to create content and also helps you to build relationships with your network. As the interviewee, taking part in an interview for a blog post gives you access to a new audience. Also, it positions you as an expert in your field. As the reader, you’ll get access to an exciting read. So go ahead and give it a go! In fact, how can you resist? If you would like help with creating blog post interviews, then drop me a line to get information about pricing.